In today’s business climate, qualities such as agility and time-to-market are some of the most valued attributes in an organization. The race to execute on ideas, fail fast and pivot when necessary is an ongoing phenomenon proving to be crucial to the workplace. 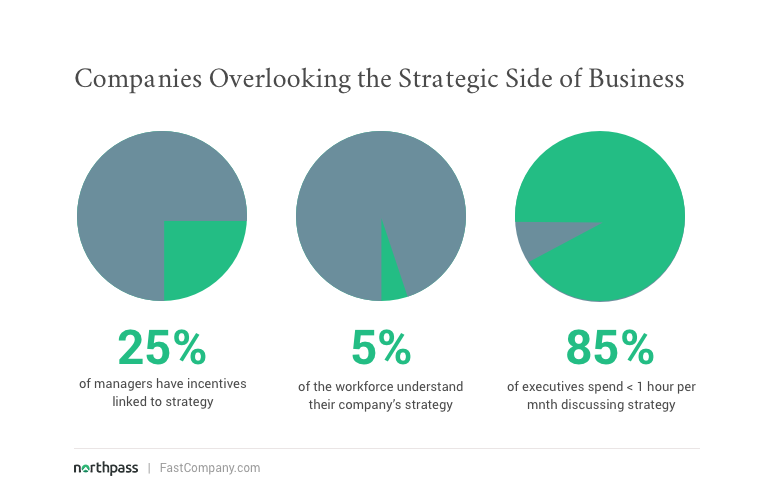 The answers to these strategy-based questions are typically assumed or it is hoped that they are found along the way. But the fact of the matter is, avoiding these questions in the beginning of any project has a very real impact on your team. Disorganization can be truly detrimental to your team’s productivity, efficiency and motivation levels. As eloquently stated by Bill Copeland, “The trouble with not having a goal is that you can spend your life running up and down the field and never score”. 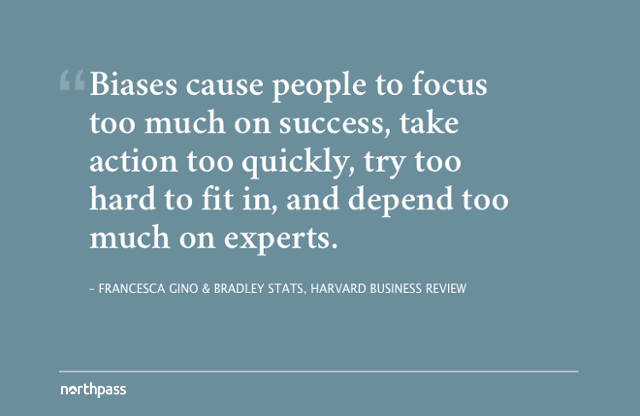 Even the most prominent companies have had lapses in judgment when their focus on execution deterred them from being strategic. Take Toyota, for example: They were known for dedicating themselves to being a “learning organization”, but have admitted to the aforementioned fault after their recall of 9 million vehicles in 2009. They were so busy in the race to become the world’s largest automobile producer, they had forgotten to take the time to learn the why’s and what’s in accomplishing their goals. Their focus on scaling gave them tunnel vision and prevented them from concentrating on their organization's overarching mission. Establishing a process for defining goals at the outset of every project can help you avoid organizational pitfalls similar to those of Toyota. SMART goals in particular can help ensure you’re always outlining the right details, keeping you on track at every stage. 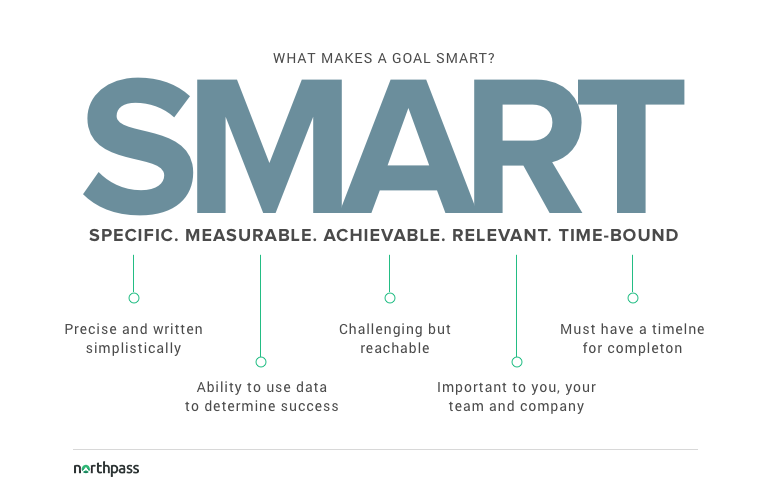 Whether you’re a project manager leading a new initiative or a business unit leader who’s in charge of managing the performance of your team members – SMART goals can help keep you laser-focused, increasingly productive and highly strategic. In this blog post, we take a comprehensive look at SMART goals. We’ll discuss why they’re important and how you can use them in any management role. 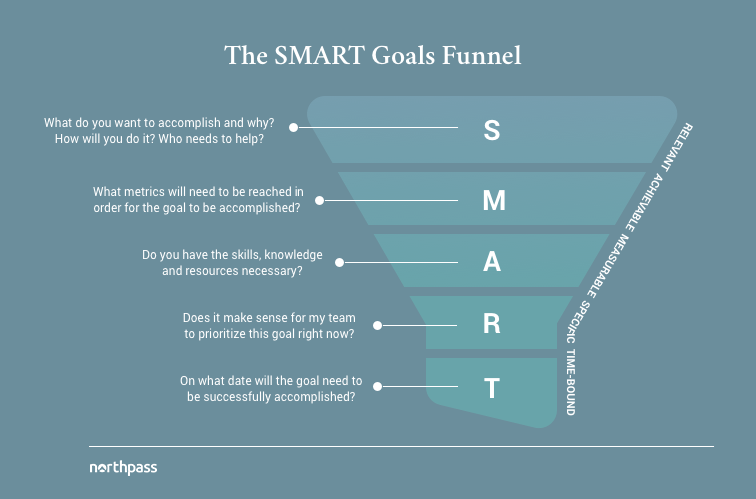 Then we’ll wrap up with a free SMART goals template you can start implementing right away. The definition of SMART goals lies in the acronym itself: specific, measurable, achievable, relevant, time-bound. It’s about formulating goals that meet the named criteria, though certain areas may change depending on the nature of your project. Before we dive into the details here’s each component of the SMART criteria in a nutshell. Specific: Precise, simplistically-written and easy to understand, even for someone with basic knowledge of the project. Measurable: The ability to use metrics to determine the success of a given project. Achievable: The goal should challenge you slightly but still be reachable with consideration to the skills and abilities of you and your team. Relevant: The goal is important to you, your team and your company. Time-bound: A timeframe for completion must be imposed. In some cases, you may see different words attached to the acronym “SMART”. For example, some will refer to the “R” as standing for “realistic” or “results-focused”. In any case, the overall sentiment of a SMART goal, regardless of individual interpretation, is very similar if not the same. From reading the definition alone, many professionals can understand how SMART goals can be beneficial in a work setting. It’s a great way to define all of the important details of a project before you tackle it. The specificity in the goal makes it clear to everyone involved on what’s to be done, why you’re doing it, and the objectives you want to reach. As a result, your team is much more aligned, focused and productive. By laying the foundation of your project with SMART goals, you are setting the stage for tasks that will need to be complete in order to accomplish what you set forth. Each goal may have objectives attached that can turn into an organized and succinct to-do list for your team. Meanwhile, the overarching goal are revisited regularly to monitor progress and keep everyone on track. This is an excellent way to create visibility and accountability among your team members. In this environment, everyone’s contributions are easily recognized so hard work can be rewarded. SMART goals also increase motivation for your team members because the results feel more tangible. For example, increasing revenue by 20% might sound like a tremendous feat. 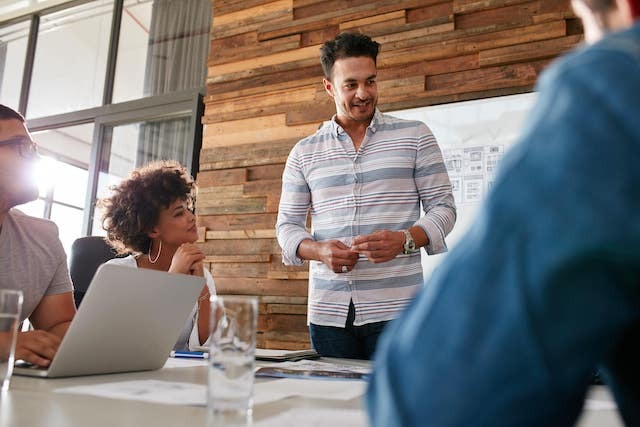 However, once your salespeople know the exact game plan you’ll be using to make it happen, they will feel much more confident about their ability to do it. And this isn’t just hearsay. Studies have shown motivation is actually tied to performance. 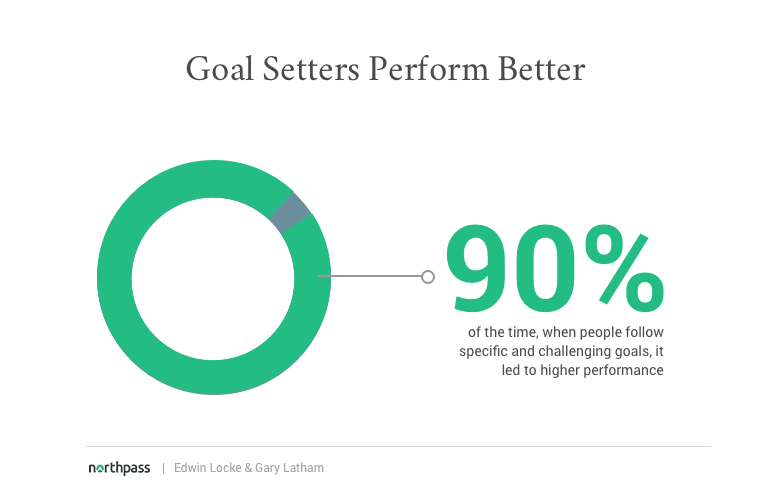 According to research by Edwin Locke and Gary Latham, they found that for people who followed goals that were both specific and challenging, it led to higher performance 90% of the time. Setting SMART goals is a great way for your team to visualize success and get energized about conquering the next mountain. 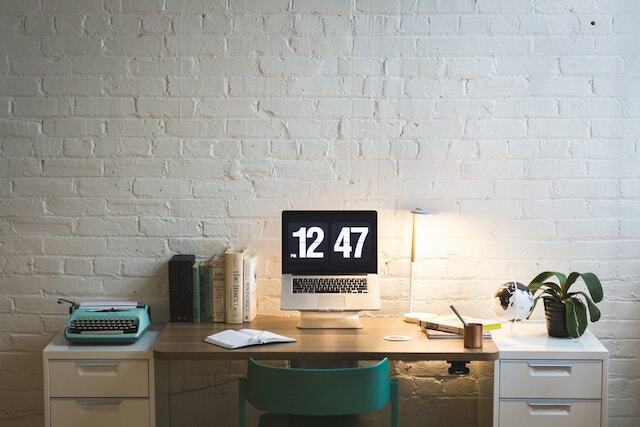 Lastly and most importantly, setting SMART goals saves time (which means it also saves money). When dealing with keeping a team aligned on a project, think about the amount of questions that are asked, meetings that are had, and time that is wasted due to the lack of centralized information. Especially when that information is thoughtfully laid out, founded on strategy and agreed upon by everyone in advance, it can be the most valuable resource in a project. And if made readily accessible to every team member, SMART goals can serve as the one-stop shop for everything there is to know about a project. The process of using smart goals is simple – create goals based on the specified criteria. By going through each criteria, step-by-step, it gives you the opportunity to assess and analyze your goals to ensure they are highly strategic. Let’s start with the following goal as an example. Now let’s push this goal through the SMART approach funnel and see what happens. The goal must be clear and concise in order for your entire team to be aligned about what it means and what’s required to achieve it. Goals that are specific should try to answer the following questions. Who will need to be involved? Using our example of “I want to grow revenue”, let’s try to be more specific. Compared to the original goal, the above goal is much more specific. Take a look at the goal deconstructed below. 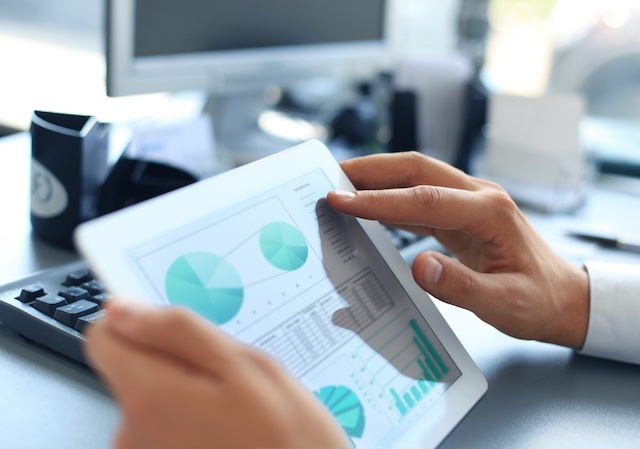 A measurable goal enables you to use metrics to show tangible evidence that you’ve succeeded. Instead of assuming what works and what doesn’t, you will know what works and have the numbers to show for it. Here are the questions you should be answering about your goals to ensure they are measurable. How will I know when it’s been accomplished? In some cases, the statement of the goal as a whole is measurable. In other cases, you’ll need to be more specific. In our example, “increasing revenue by 20%” is measurable, but “closing more deals” is not. How can we be more specific about “closing more deals” in a manner that makes this piece a measurable metric? The number of deals closed and the average MRR value of the deals can certainly be measured with data. Therefore, when you’ve closed 50 deals at $1500 average MRR, you’ll know that you’ve accomplished this goal. A SMART goal should be achievable within the confines of your skills, knowledge and resources. This, however, doesn’t mean it should be easy. The goal should still challenge you, but not to the extent that you are more likely to fail than succeed in achieving it. It is afterall, still a goal – and all goals should help you grow and improve. So the questions you should be asking at this stage are as follows. Do I have the skills and knowledge necessary to achieve the goal? Do I have the resources necessary to achieve the goal? Does the goal challenge me and my team to be better, improve and grow? Returning to the example below, think about the accessibility to skills, knowledge and resources that are either explicitly stated or implicitly assumed in the goal statement.  Access to a sales team is directly stated. 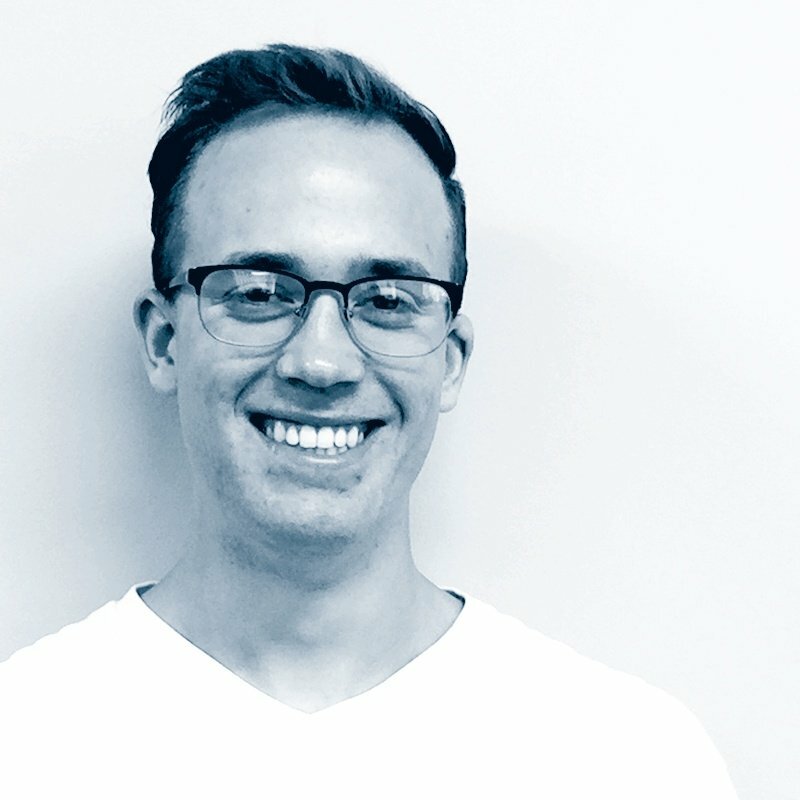 However, what’s not stated is that the team has the selling skills necessary to close 50 more deals, or that they have the software to manage those deals through their sales cycle. Moreover, will the product they are selling be mature enough to show sufficient value to the market and get prospects to buy at that price? These are the types of questions you should be asking about your specific goals. And only when you feel you are fully equipped to accomplish the goal can you say that it is achievable. Setting goals that are achievable is also a psychological tactic for reaching success. 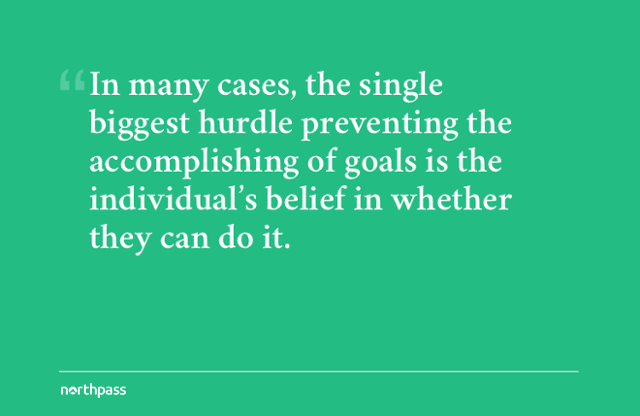 In many cases, the single biggest hurdle preventing the accomplishing of goals is the individual’s belief in whether they can do it(even if they do have all the necessary resources). At this stage, creating a goal that you believe you can achieve is an important first step. Properly planning out the details of how you’ll achieve will also be necessary and critical hereafter. In this step, you must evaluate the importance of the goal, not only to you, but to your team and company. Think about whether it aligns to the values of your coworkers and company’s mission as a whole. Answering the following questions should help you through this thinking process. Does this align with the needs and efforts of our team and company? Is it applicable in the current business climate? As you brainstorm your answers, various considerations may come to mind that may require a pivot. Perhaps a recession in your industry has shown downward trends in investments in products similar to yours, or you determine that other prerequisite goals must be accomplished before starting this one. Using our example, here’s how the goal setter might answer the relevancy questions. Is it worth the time and effort? Yes, growing revenue is the most important metric in our business. Is this the right time to tackle the goal? Yes, our revenue has been steadily increasing over the past year and we’re now about to launch a feature that is in high-demand in our market. Does this align with the needs and efforts of our team and company? Yes, the sales team is incentivized by commission on closed deals and our company mission has always been to become the top player in our industry. Am I the right person to reach this goal? Yes, I am the sales director and it is my responsibility to lead my team to close more deals and increase revenue. Is it applicable in the current business climate? Yes, industry trends and reports show our market’s value doubling in the next five years. Every goal should have a timeline for completion. This creates a sense of urgency in achieving the goal. Without deadlines, progress may stagnate as different team members prioritize tasks in different ways. A time-bound goal creates a positive tension that keeps people moving and ensures they’re on track with their deliverables. There is only one question to answer at this final step, and that is the question of when. On what date do you want to accomplish this goal? Achieving a goal in six month’s time is a lot different than achieving the same goal in one week. For you to be able to set a realistic timeline, you should break the goal down into objectives and even tasks that can be assigned to specific team members. To help with this, bring team members together to estimate the time it would take to complete each task (consider using SCRUM methodology to help with estimating times for each task on a consistent basis). That estimation will enable you to set deadlines on specific tasks as benchmarks for accomplishing the larger goal. 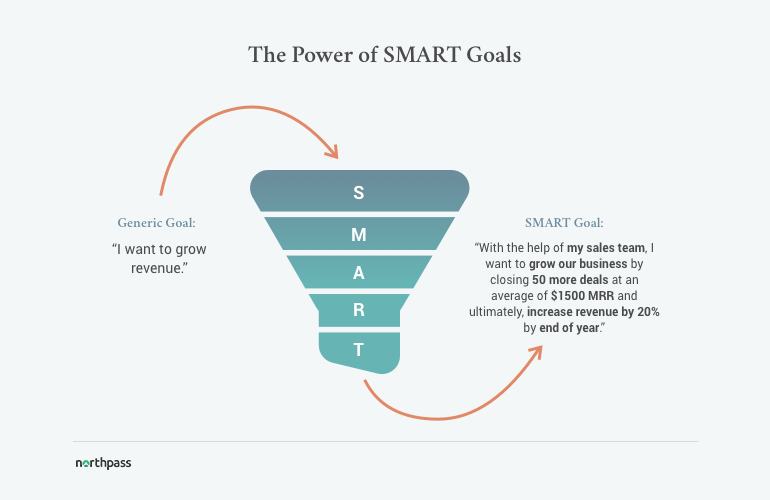 Notice how much more comprehensive the SMART goal is compared to the original goal. It leaves little room for interpretation and feels much more tangible. 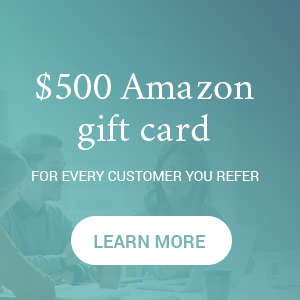 This SMART goal statement alone could help a sales team stay aligned on how many deals each account executive must close and at what value and frequency. With a plan in place for execution, the team would be on a great track to hitting those numbers. Remember to do plenty of research as you set your SMART goals. This shouldn’t be a process of guessing, but rather one of informed decisions. Sure, there will be times when making projections is necessary. However, even then, your projections should be based on trends and data that support your argument. As with all goals, setting the goal is only the first step. From here, you’ll need to develop a plan of attack, delegate responsibilities, monitor progress and assess both your successes and failures. Your successes will tell you what you’re doing right, while your failures will provide excellent insight into how you can improve. Now that you have the knowledge necessary to create and execute on SMART goals, below is a helpful template you can use to streamline this process. The SMART goals template offers a synopsis of each SMART criteria in a table that is easily editable when you’re ready to create your first SMART goal.